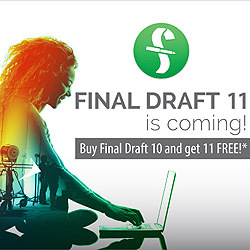 Alejandro Seri, Director of Education, will show off the exciting new features in Final Draft 11. This class will give take a look at the new immersive cinema VR screenwriting template in Final Draft 11. Also includes pro tips & tricks on how to use the Beat Board, Story Map, images and collaboration tools. Whatever time of year it takes place, LSF feels like the start of the writing year. I come up with enough new ideas and new lenses through which to re-examine my existing work.